… but I’ll have you know, it just so happens to be the ultimate movie snack. A haystack of hot, crispy, salty, sweet potato chips, ready to be dunked into a smooth avocado creamy dip. 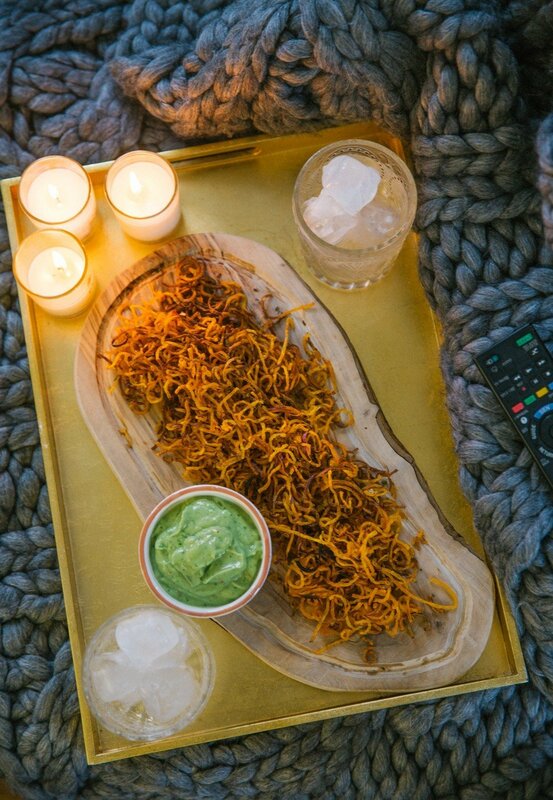 Just the ticket when you want a cosy night in, and don’t want to gorge on junk snacks. A stack of these will beat a bag of crisps any day. Much better for you, too! Pre-heat your oven to 180C/350F. No need to peel your potatoes, just spiralize them as they are. This is my spiralizer of choice, but you could use a veg peeler or mandoline if you prefer. Add your spirals to a bowl and toss in a drizzle of oil. I used truffle oil, because I can’t get enough of anything truffled! Spread them out nice and evenly. Dust with oregano and a pinch of rock salt. Bake for 20-30mins, depending how fierce your oven is. Just make sure you take them out and toss them about every ten mins. Sadly they lose almost all of their good looks, but don’t worry, they’re only getting tastier! When you’re happy with them, pop onto a paper towel to cool and crisp up a little. Some will go very crispy, others will be chewier. Don’t worry, it makes for the dreamiest of texture combos. While you’re waiting, puree your avocado with the rest of your dip ingredients. Once it’s utterly smooth, pour into a little bowl and you’re done! Light some candles, snuggle up and serve. Pinch ’em, grab ’em by the handful, dunk and devour. You’ll never feel quite the same way about a bag of crisps again! Now if you’ll excuse me, I have some Netflix to watch and a haystack of chips to enjoy. This is what they call being a couch (sweet) potato!